The attack of 9/11 changed Chasen Ward. He switched career paths to become a SEAL and devote his life to fighting terrorism and protecting civilians. While that fulfills his work life, the hazards of his job are more than most women can take. The last thing he expected was to meet a woman whose job was as risky as his. He’s falling fast for Hayley, but now she’s in jeopardy. When Hayley is kidnapped, Chasen will turn San Diego inside out to find her. But will it be too late? I thoroughly enjoyed listening to the audio version. A nice change where the female, Hayley, also travels to dangerous locations, gets called at a moment's notice and never knows how long she'll be gone. She meets her SEAL when he rescues the reporter from terrorists. They are separated while he goes back into danger for more captives. Back at home, a chance meeting gives them the opportunity to get to know each other. Both are professionals and have been in their jobs for a time. The attraction is immediate and it doesn't take long for Chasen to make his move which she readily moves right into. Their first date is a girl's fantasy come true. The second is a BBQ with the team and their ladies and family. Will she fit in with his team that has become his family? Hayley refuses to admit she is having symptoms of PTSD. She feels like someone is watching her, but knows it isn't true. She's restricted stateside by her boss after her close call. Hayley is not one to sit back and watch. She gets involved in a dangerous investigation. Will Chasen be called to rescue her again? If so, can he do it twice? The characters are ones you want to succeed professionally and personally. There is plenty of steam. The teammates are introduced. I for one am glad this is just book one of the series. Those guys are hot. Ms. Tyler gives us action, emotion, steam, and a couple worthy of the great story line. Have you listened to any of Rhiannon Angell’s other performances before? How does this one compare? This was my first Paige Tyler's book and it definitely won't be the last. I love romantic suspense and this one is very great! This book has it all: suspense, romance, fast pace, steamy. Some scenes are like in a movie! I love the two main characters, Harley and Chasen. They are both strong. This story, so well written, kept my attention from the beginning. I like the description of the seal training! This was also my first listen to Rhiannon Angell and she has a great voice. The narration was very well done and easy to listen. I can't wait to listen to the second book in this Series. I received this free review copy audiobook at my request and I have voluntarily left this review. Poor narration for alpha men. Truly, it sounds like a cartoon voice for a man. HunKy alpha SEALS with high pitched squeaky voices. The biggest problem is the listener can't differentiate between male and female voices. The ladies voices were fine but I was still not able to know who was talking. SEAL for Her Protection I liked the story. But the person speaking was not into the story. and that's why I will end the book by reading the rest. This is a good series with some great characters. The narrator is horrible. She needs to get a male narrator for sure! Lots of action. I actually enjoy hearing about their missions more than anything. It started off with a bang and didn’t slow down till the end. Kept me hooked. Danger seems to follow Hayley in her job of reporter. Hayley is a news correspondent held captive in Nigeria until she is rescued by a Seal team. One of the Seals, Chasen, becomes enamored of Hayley. 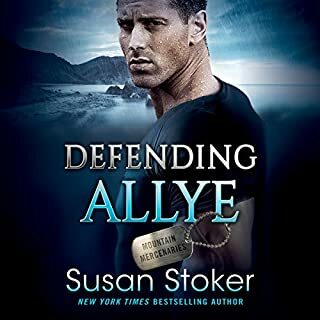 Harley has an assignment on the Coronado Seals base where she is reunited with Chasen. They begin dating and both are falling hard. Once again Hayley is kidnapped. This time right out of her apartment. Chasen has friends help him find her location then his Seals team goes in to rescue her. It is a shock who has kidnapped her. Well written with just enough tension. Loved the story and characters in this book. Elements of action, romance, and suspense kept me hooked from the beginning. The narrator did a fantastic job of bringing the story to life with changes of voice and tone. I received a free review copy of this Audiobook at my request and I have voluntarily left this review. I love this authors characters and stories. She writes to give the reader the complete experience. You truly feel like you get to know the characters and are apart of their story. Great job Ms. Tyler !! !